Born on January 4th, 1983, Kana Uemura (植村花菜) is a talented Japanese singer. She also writes and composes most of her songs. Kana also plays guitar. 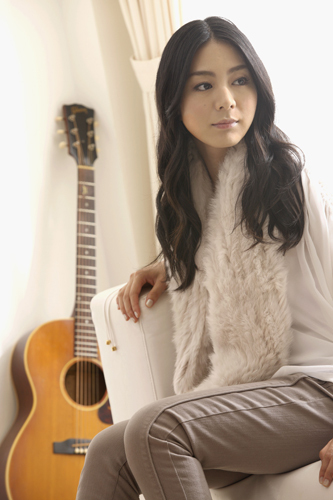 Her song “Kiseki” is the theme song of the video game “Tales of Commons”. Kana was inspired to sing from a young age of 8 after watching the movie “Sounds of Music” in which she believe that through music, you would have the power to connect to people and obtained courage from it. So it had been her dream ever since to make people smile through music and thus pursued to become a singer herself. She later learned to play a guitar and started to perform as a street performer also began to write her own songs. Kana then participated in a street musician audition along with other 1200 participant and managed to find herself an opportunity to debut. To date, she had released three full albums – “Itsumo Waratteirareru Youni” (2006.1.4), “Shiawase no Hako wo Hiraku Kagi” (2007.1.4) and “Ai to Taiyo” (2007.11.7) – one mini album, “Haru no Sora” (2009.3.25), and nine singles.